The first time I heard this song, it really gives me inspiration. Gave me different perspective and hope in Life. Songs for a New World is a collection of songs created by Jason Robert Brown that is set to be performed as a revue or song cycle in an off-broadway performance in WPA Theater in New York city 14 years ago. 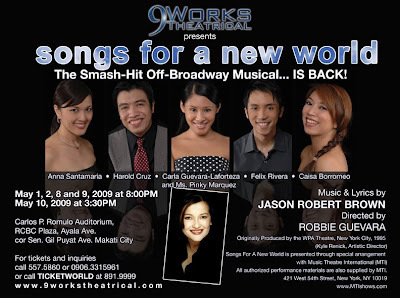 Now, 9Works Theatrical headed by the stage genius Robbie Guevara, director of last years "A Christmas Carol" and last February's "I Love you Because" took the liberty to take the song collection up to another level. 9Works wrote a script based on the songs interweaving each others to create a unique tale. A tale about family, distance, money, technology, love and hope. Songs for a New World is 9Works Theatrical's premiere presentation following its official launching as a new Theater company last monday in A.Venue Hotel. Headed by Robbie Guevara (stage actor and director), Mio Infante (Scenographer) and Santi Santamaria(Corporate head). With the growing public demand on stage musicals and plays, these 3 friends decided to create another outfit that will produce quality shows for Theater lovers. After the success of the first run of Songs for New World last August, people demanded for a rerun. So here it is. The show is nothing without the performers. The Performers chosen on this presentation are just one of the finest actors and performers on stage known not only in stage but even in movies and TV. The cast includes Felix Rivera (Avenue Q, Spelling Bee, Mulan Jr.) who will play Murray and Sam, Carla Guevara-Laforteza (Avenue Q, Spelling Bee) as Veronica, Caisa Borromeo (West Side Story, I Love You Because, Hairspray) as Lisa, Anna Santamaria (I Love You Because, A Christmas Carol) as Amy, Harold Cruz (La Boheme, I Love You Because) as David and last but definitely not the least, Ms. Pinky Marquez (Mulan, Christmas Carol) for a very special participation playing the character of Mrs. Claus. Robbie Guevara will direct this presentation with Peachy Atilano as Production manager and Dax Carnay as Stage Manager. Other members of the production staff are Mio Infante (design consultant), Martin Esteva (lighting design), Ceejay Javier (musical director), Felix Rivera (vocal coach), Francis Matheu (choreography), Shelyn Tayanes (marketing), Santi Santamaria (sales), Anna Santamaria (finance), Joselito Tolentino (PR consultant), Jonjon Martin and Carlos Canlas (publicity). Catch Songs for a New World in the following dates: May 1 and 2, May 8, 9 and 10. All performance will be held in Carlos P. Romulo Auditorium in RCBC Plaza Ayala Avenue. For tickets and inquiries please call Ticketworld at 891-9999 or call 9Works Theatrical at 557-5860 / 0906-331-5961. See you at the theaters and let's enjoy 9Works Theatrical's Premiere Presentation. Thanks for your support!!! :-) see you in SFANW! I'll inform you when you can watch. :-) keep in touch!! !